Government agencies are being tasked to modernize technology in a dynamic IT landscape. IT leaders across the federal government are looking for a solution to meet mission need, improve efficiencies and prepare for the future. 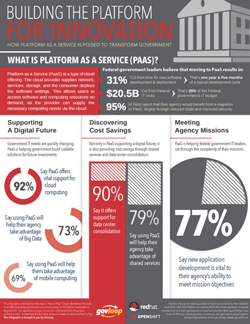 Agencies need to look no further than Platform as a Service (PaaS). Platform as a Service (PaaS) is a type of cloud offering. The cloud provider supplies network, services, storage, and the consumer deploys the software settings. This allows users to access software and computing resources on demand, as the provider can supply the necessary computing needs via the cloud. Explore our latest infographic to learn more. This infographic used data from the report: “PaaS or Play? Cloud’s Next Move.” The data from a Meritalk study and is based on an online survey of 153 Federal IT executives in August 2013. 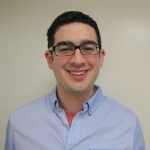 The report has a margin of error of ± 7.89 percent at a 95 percent confidence level. To download the full study, please visit www.meritalk.com/PaaS-or-Play.